To call what is being done marching is a bit of a misnomer- a caravan is more accurate. I live on a small Soi off Sukhumvit road, Sukhumvit is a major road and is always clogged with traffic; it is also the hub of a great deal of shopping, hotels, entertainment and business and is a great place for a group like the red shirts to caravan. The red shirts came through a few times last week, all very peaceful and organized. The caravan did cause some traffic delays, but the Bangkok police were assisting by blocking some intersections and then stopping/interrupting the caravan to let cars through at the busy intersections. The march or caravan is large and takes up to 30 minutes to pass through, it was estimated that up to 60,000 people were in the march that took place on Saturday 20 March. The atmosphere is like a parade- music, trucks, red flags and a great deal of waving. The marches, caravans continue to be very peaceful and impressive in their size. The weather is now hot- generally in the mid-90’s each day- the red shirts are having the marches during the midday heat. 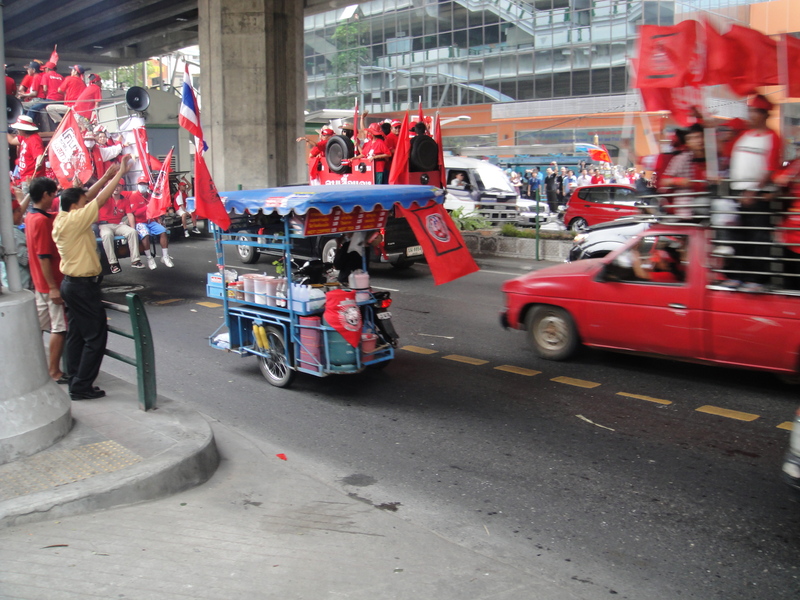 Included in the marches are food cars, water carriers and paramedics and the red shirts guards. A number of monks were in the latest marches, many support the red shirts, but their other purpose has been to encourage peace from the red shirts and the police or any opposition groups. The red shirts have been alerting the city as to the march route, the city will deploy police, military and traffic personnel to assist. The red shirts have been avoiding the neighborhoods where violence broke out during their rally in April 2009. 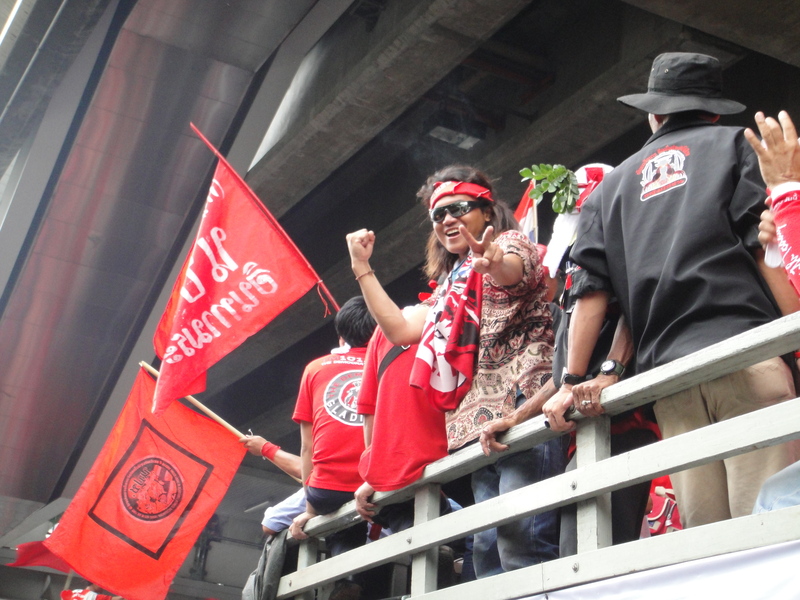 A major point of the marching and caravans has been to win the support of the people in Bangkok, this support is key to the future of the protest as the majority of the current protestors is from outside Bangkok and must return home. It appears they are winning bits and pieces of support in Bangkok as many people turned out to cheer the march as it went past and even joined in. 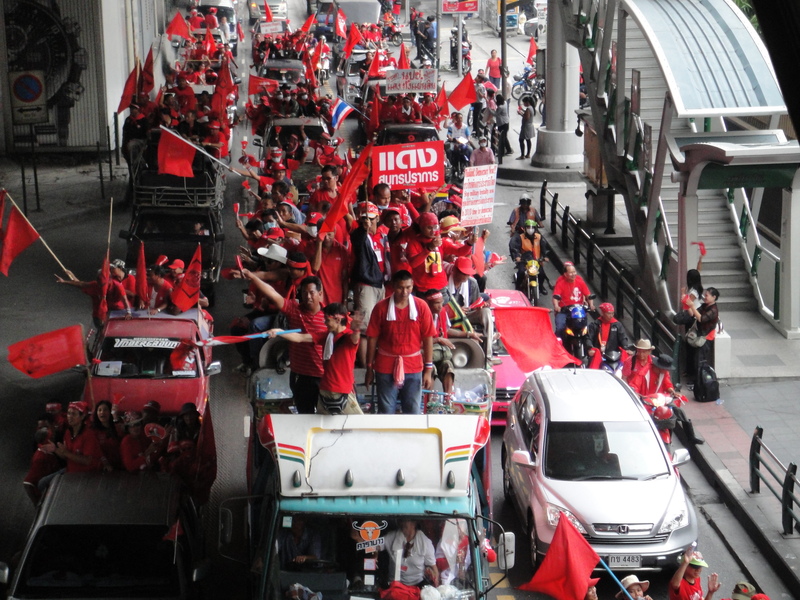 All continues to be peaceful, the red shirts camping out near the government buildings, holding rallies and marching on the weekends. As the pictures demonstrate, the red shirts are not a wild roving band, but a large, well organized group that is very friendly during their marches. There is no interruption to any services or closure of key tourist attractions or parts of town, Bangkok is safe and perfectly fine to visit. 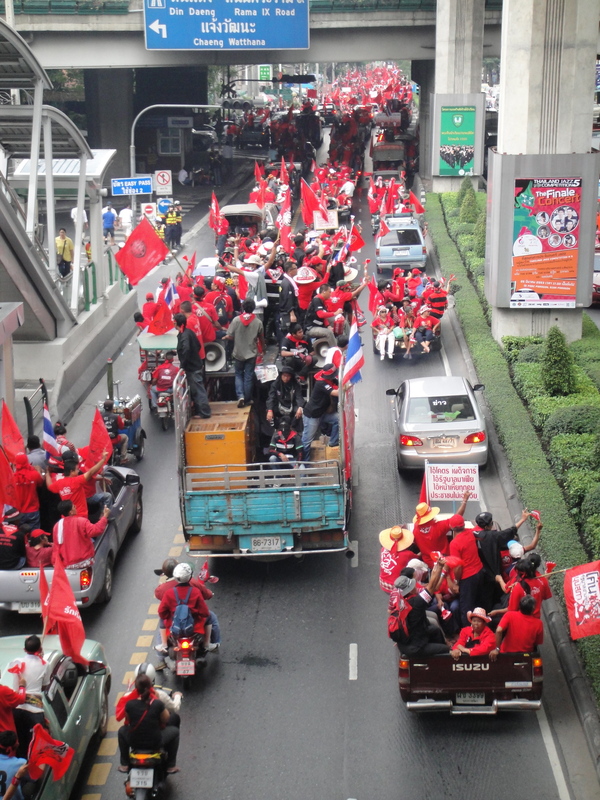 This entry was posted in Bangkok, Politics, Thailand and tagged Red Shirt March, Red Shirt Protest, Red Shirt Rally, Red Shirts Bangkok. Bookmark the permalink. i searching an information of bangkok and read your blog. well… i have some questions wanna ask , its about live and stay in bangkok… so do you mind to contact me through my email. thank you so much.